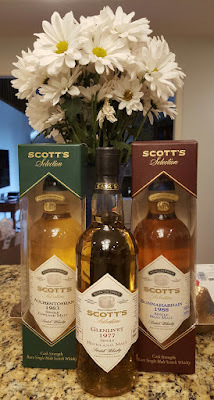 Almost a year ago, Binny's Beverage Depot dropped the prices on all their remaining Scott's Selection whiskies. So four of us whisky gents split three of those bottles. Not too long after that, Binny's stopped shipping to Ohio. That's a bummer, but it has kept my whisky purchases limited, which is not a bummer. It took a while before I tapped into my portions, but once I did they didn't last long. Luckily I saved 2oz of each for reviews......which are happening this week, starting with the oldest of the trio. A Glenlivet distilled in 1977. Distilled by: The Glenlivet Distillers Ltd.
Its color is light amber, which bodes well. The nose starts off big on peach and mango. Then lemon zest and cantaloupe. Some shortbread and confectioner's sugar. Its palate is completely different than the nose: sharp, tart and tight. Barley, lemons, limes, almonds and a hint of vanilla fudge. It finishes warm and simple. Vanilla simple syrup and barley. Tart, with a slight bitterness. The nose gets creamier. More vanilla. Ginger candy. Most of the fruits are gone. Only lemons and overripe peaches remain. The palate becomes softer, but no more complex. Lemons, barley, mild bitterness and woody/papery note. The finish hasn't changed much. Just a little sweeter. The nose feels younger. Wort, salt water taffy, orange peel and vanilla. The palate is tangy and tart. Slightly woody and a little peppery. And that's it. The mellow finish has a melon note and acidic citrus. Normally, I don't add much (if any) water to a whisky north of 25 years. But this one's palate would not open up at full strength. A little bit of water didn't do much, and by the time it hit 40%abv it was nearly dead. This unfortunate because the nose was gorgeous at cask strength. Water didn't kill it, but it didn't improve it either. Had the palate sung like the nose, this would have been a dynamite thing. The finish was alsio oddly flat and short throughout. These issues have me guessing that there was some lethargic "Oakwood" involved. Great nose, though. If memory serves...you did get that '80s Caol Ila which wasn't too shabby. I think I liked this one the best of all, but I don't think I wrote down notes for it yet. I still have some left. "Honey racks, painter's studio (oil paints, paint thinner), old warm wood. All of it soft, glowing, evocative. Some good, old-whisky bitterness on the nose. Same bitterness dominates on the palate, with some initial sweetness that then recedes. Less development on the palate than expected. With time in glass, the best Glenlivet profile comes out: rich, warm, sweet, honeyed and flowery aromas: elder flowers, spring meadow. The finish is very long and persistent, consistent with the nose & palate, slightly heavier on the oak. Beautiful whisky! Not the most elegant but rich, generous, warm, and satisfying! I would have loved a bottle! 88pts." I did love the nose on this one. This is a remarkable bottle, if nothing else because it introduced me to the Kosher Whisky Reviewer, who is a nice piece of awesome. Now I know where you got inspired for your beard phase!